See You At The Beach. Spectacular Views. 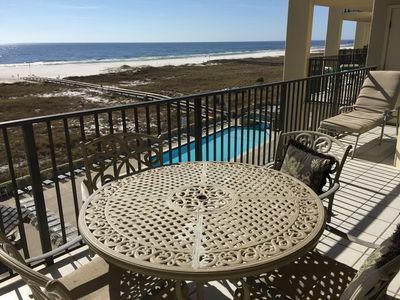 Make your dream vacation come true when you stay in this 2 bedroom unit at The Palms in Orange Beach, Alabama! 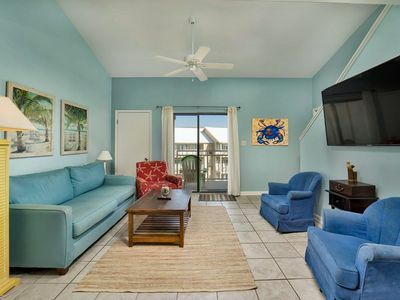 This complex is situated upon an immaculate stretch of the Gulf Coast, where miles of sugar-white sands give way to shimmering emerald waters and endless horizons, creating a perfect setting for an unforgettable vacation! 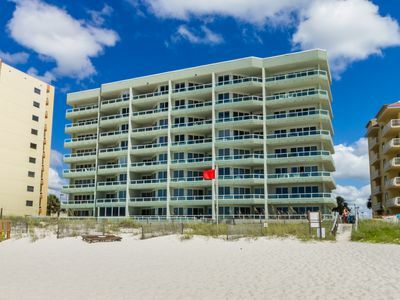 This complex offers an abundance of amenities including a beach-side outdoor pool and heated indoor pool for use on those cooler days and nights. There is a fitness room with weight machine, stair machine, treadmill, and sauna. Elevated lighted tennis courts are available to you, as well as a grilling area. A private boardwalk invites you out to the famous sugar white sand beaches, where padded chaise lounges and umbrella rentals are available. 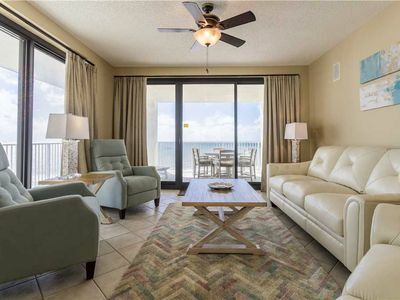 This 2 bedroom unit offers almost 1200 square feet of gulf front living and an open and floor plan. 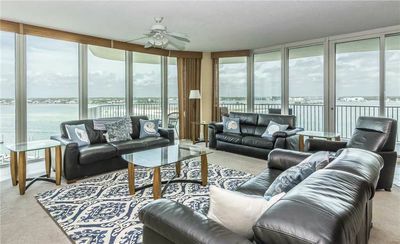 The living area hosts a queen sofa sleeper and recliner, a large LCD television and most importantly, beachfront balcony access! 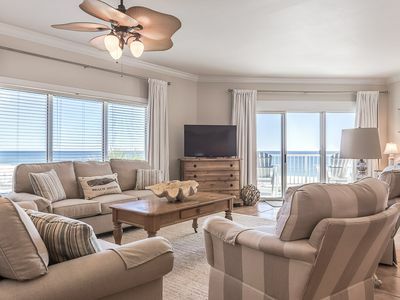 Floor-to-ceiling sliding glass doors open to the covered balcony were you can enjoy your favorite beverage while delighting in views of the sparkling Gulf Coast! 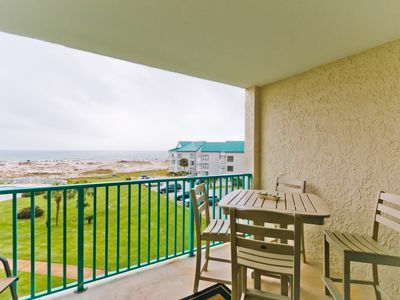 Watch the sunrise and fishing boat traffic at Perdido Pass while drinking your morning coffee. The kitchen is equipped with everything you?ll need to create the perfect meal, including a breakfast bar and all the small appliances and utensils necessary to get cooking! The dining area features a glass top table with seating for 4, with additional seating for 2 at the breakfast bar. The master suite boasts a king bed, an LCD television, DVD player, and separate bath. The second bedroom is appointed with two full beds and a television. This unit also features a full size washer and dryer. 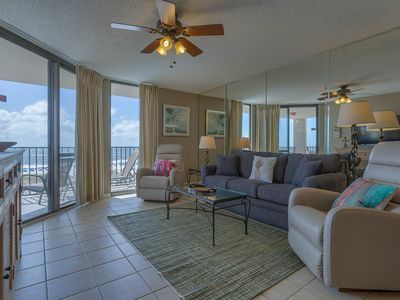 You get all of the conveniences of a larger condo without the large price tag! 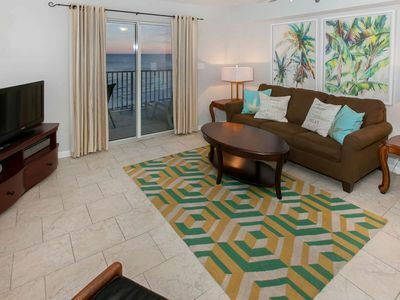 The Palms is just a short drive from some of the best restaurants, shops and nightlife on the island. The Wharf is also just a few minutes away and hosts many fine dining and casual restaurants and bars, boutiques, a marina, and a 10,000 seat amphitheater that features some of music?s biggest names year-round. There?s tons of recreation and fun for the whole family to enjoy! You will also enjoy the services of a local liaison that will see to your every need throughout your stay. 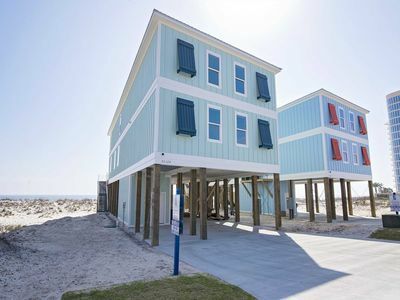 Alabama Coastal Properties offers 24 hour local support to make sure your stay is absolutely perfect and stress-free! Stop dreaming about your perfect vacation and finally turn it into reality! 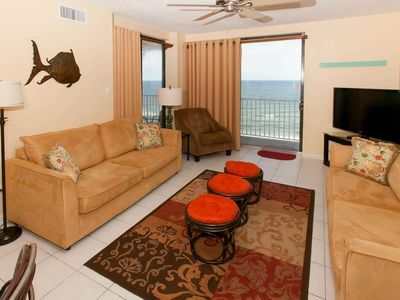 Book with us today and experience your best vacation yet! Four Winds 703 - FREE GOLF, FISHING, DVD RENTALS, WATERVILLE AND ESCAPE ROOM TICKETS! 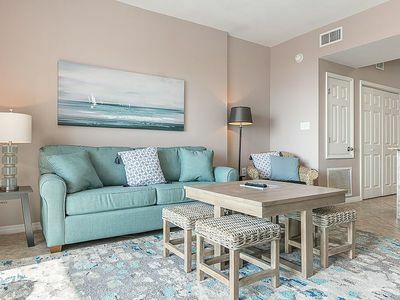 Romar Place 1002 - FREE GOLF, FISHING, DVD RENTALS, WATERVILLE AND ESCAPE ROOM TICKETS! Tidewater 204 Great Deals on "gap" stays! 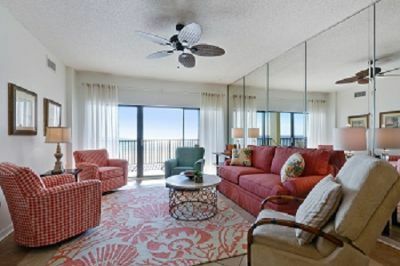 Spacious 3 Bedroom Condo on 4th Floor With Views of Gulf And Pool! 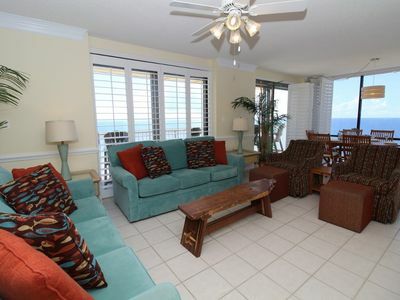 Summer House 1501B - East Corner Penthouse with Gorgeous Views!